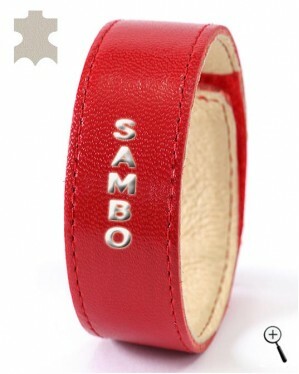 The magnetic accessory labeled "Sambo" is made of red real leather. The lining of the magnetic accessory is porous leather in natural color, creating comfort as it absorbs sweat without stifling the skin. The magnetic accessory is easily cleaned in the contact area in tepid water with a slight wipe of the lining.